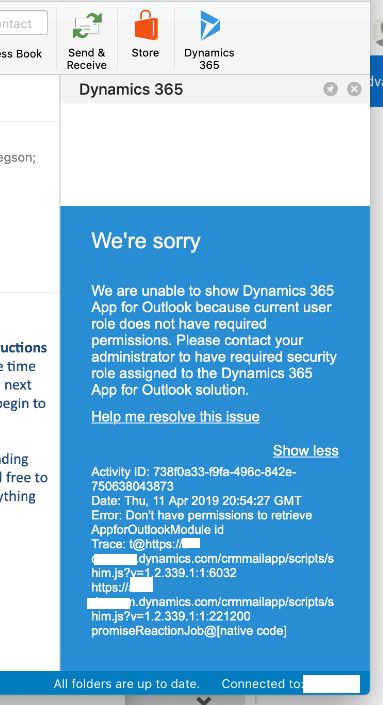 We do not appear to have a unique security role called Dynamics 365 App for Outlook User that many forums and the Microsoft website reference but system admins are able to use the app without that role added to their user profile. Per the deployment instructions, I did verify that the salesperson security role had privileges enabled for the Dynamics app for outlook. Has anyone encountered this error and can guide me towards a solution? I've been receiving the same error, just started a couple of days ago. However I am a system admin so I'm no sure if it is related to a security role. Are just your new testing users receiving this error or both new and system admins? Just new users. None of the admins are receiving this error. Thanks, Aaron! Yes, I have already checked the security settings and we're good there too. Hi Rosemarie, Does you app entity have the privileges as shown in the attached image? @Rosemarie Cordell, I recently closed a ticket with Microsoft on an error issue. Despite what the docs show (https://docs.microsoft.com/en-us/dynamics365/customer-engagement/outlook-app/deploy-dynamics-365-app-for-outlook#required-privileges), the support team also suggested that I add Business Management > Security Role > Read. It seems to have solved my issue. When I started the support ticket, the docs showed a specific security role for the app. However, an overly eager docs editor had posted those details, yet the role was not yet publically available. Fingers crossed that it will appear soon for a more effortless admin experience. All set to Org level permissions. 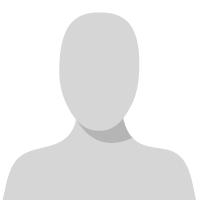 To complete the magic recipe, my users also have Sales Manager, Insights User, and LinkedIn Configuration. I would double check to make sure that the security roles you have are enabled for the App. Hover over the Dynamics 365 App for Outlook and Click on the ... and then Manage Roles. Then scroll through the roles and make sure that your security roles are selected and click on Save. Sorry, I realized that you already make sure the security roles were enabled in my previous post. the other piece that we had to set was was to ensure these security privileges were enabled. The old documentation made reference to App, but its been split to be Canvas App and Model app.